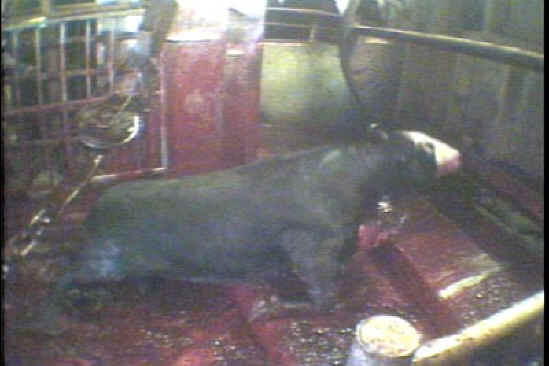 (Cattle Exploitation - Beef - 17) This a still from the undercover video taken by a PETA investigator at AgriProcessors kosher slaughterhouse in Postville, Iowa. "The entire machine rotated, turning the cow upside-down. This process seemed to terrify him—his eyes were wide with fright—I imagine because he had never been in such a helpless position. 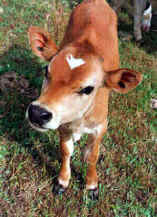 The cow’s exposed neck was scrubbed with a hose and brush, then a rabbi came out of a small room and slit the cow’s throat. Another worker followed the rabbi and gouged a chunk of flesh out of the cow’s neck and then pulled his trachea or esophagus (I’m not sure which one) outside of his throat so that it hung down. Then the machine reverted the cow into an upright position. The trap door on the side opened up and the cow was dumped onto the floor, where another worker attached a chain to the animal’s ankle so that he could be hoisted into the air and sent down the line."